The Lok Sabha Election is knocking on the door. All parties are bringing out their big guns to impress the people and bring them on their side. Amidst all this, Modi announced a new scheme that has created a wave of debates in the nation. There is no dearth of reservation schemes for lower caste people. Modi things it is time to offer some respite to people who suffer from financial issues, but belong to the upper castes. He announced the implementation of Aarthik Aarakshan Scheme under which upper caste poor individuals will be entitled to special 10% reservation in government job and education institutes. Development of poor individuals – Reservation schemes has always been implemented for the development of the weaker sections of the society. This reservation also promises to pave new opportune ways for the eligible applicants. Financial soundness of the candidates – This particular reservation project has been introduced for poor people who belong to the upper castes. There are hardly any reservation projects, which guarantee a place for upper caste people. 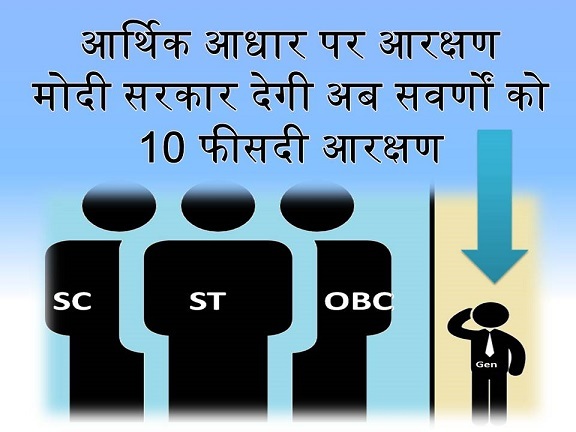 Total reservation – The central government has promised that it will offer a reservation of 10% to the upper caste individuals, which fall in financially weaker categories. Job and education related reservations – If the implementation of this project takes place, then upper caste poor candidates will be receive registration in several fields. The two primary sectors are in respect to education and government jobs. Eligible candidates will be able to apply for jobs or education in government institutes as per this reservation scheme. Upper class poor individuals – There are many reservation schemes for lower class people. With the implementation of this scheme, the central government wants to bring in reservation for upper class people, who fall in low income groups. Family income criterion – It has been clearly mentioned in the scheme draft that if they total family income of the interested applicant is more than Rs. 8 lakhs on an annual basis, then he/she will not be able to attain the perks of this reservation. Agricultural land – It has also been mentioned that is the family has a farming plot that is more than five acres in measurement, then the family will not be able to apply for this reservation. Measure of the home – The applicants must make sure that their residential home is either less than or equal to 1000 square feet in measurement. If the measurement exceeds this number, then the applicant will not get the reservation benefits. Plot possession in urban areas – In case the family has a plot in any city that falls in the municipal sector and measures over 100 yards will be barred from getting the reservation perks. In case the family possesses a plot in non-municipal areas, with an overall measure of 200 yards, then they will be eligible for the reservation. Though the ruling party is trying to highlight the good intentions of the PM, others have a different opinion. Opposition and Mod critics say that it will be absolutely impossible for the present government to implement the scheme. It has been called an election gimmick, and that the central government is trying to gain ground before the Lok Sabha election in 2019. Matters like reservation of seats are specified in the Constitution of India. If the central government wants to implement this scheme, then it will have to bring about changes in the Constitution. Amending the Constitution is a rather length process, and it will not be complete before the election. The bill will soon be submitted in the Rajya Sabha and Lok Sabha. If the bill gets a majority of the votes of the members, only then it will be considered for implementation. As it is unlikely that the reservation amendment will be done, it is obvious that the members of the two houses may not vote in favor of this bill. Reservation in the higher education institutes and government job sectors is a topic that has been debated over for several years. This subject is the cause of conflict between different castes and categories. Many feel that the reservation system bars eligible and more meritorious candidates from getting a shot at better future, which quota candidates get the seat easily with far less eligibility. It is time to take stringent action to eliminate the evils of reservation system, and offer equal platform to all with similar merit.